Centered at 34.308°N, 117.499°W the quake occurred at a depth of about 11.5km (7.2mi), according to USGS/EHP. FIRE-EARTH Science Team has suspended its research on California seismicity, Japan ditto. M4.2 Strikes near Westwood, Calif. Centered at 34.100°N, 118.491°W, the event occurred at a depth of about 4.5km, according to revised data posted online by USGS/EHP. 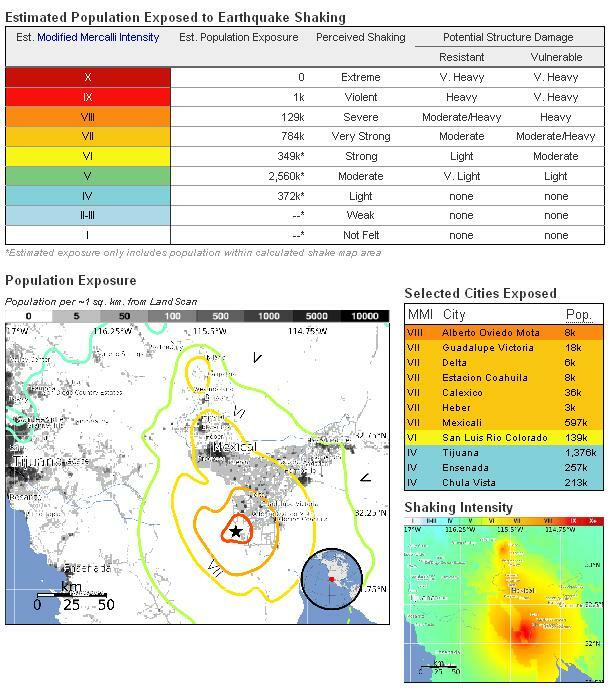 Meantime, USGS/EHP has revised details of an earlier quake that struck Los Angeles area in May as follows. Due to the reasons explained previously on this blog, FIRE-EARTH Science Team has suspended its research on California seismicity, Japan ditto. Centered at 34.135°N, 118.486°W, 10km (6mi) NW of Beverly Hills, California, the quake struck at a depth of 9.9km (6.1mi) on Monday March 17, 2014 at 13:25:36UTC. The event was followed by a small aftershock measuring 2.6Mw, which occurred three minutes later. Due to the reasons explained previously on this blog, FIRE-EARTH Science Team has suspended its research on California seismicity. 1 Day, Magnitude 2.5+ earthquakes Worldwide- December 23-24, 2013. There are 28 Earthquakes on the map. Multiple earthquakes striking the same location aren’t visible due to size restriction. Source: USGS/EHP. Map created by FIRE-EARTH blog. Centered at 35.811°N, 119.801°W, the quake struck at a depth of 22.2km (13.8mi), reported USGS/EHP. 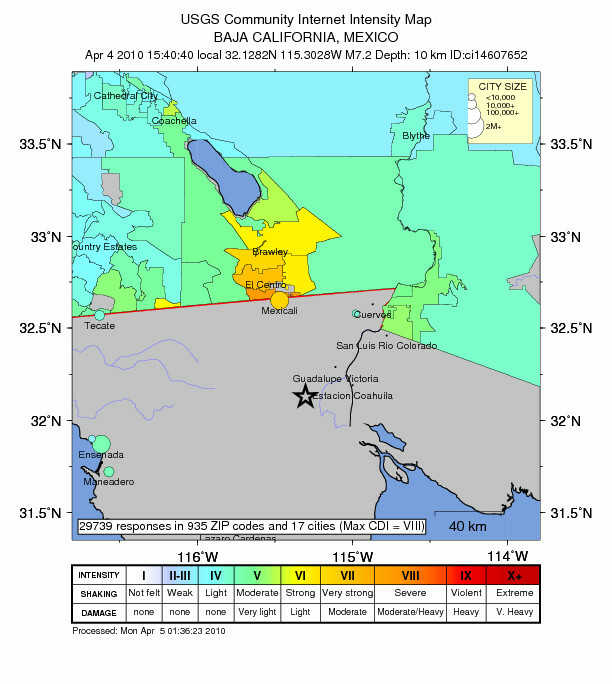 M5.7 quake strikes near Canyondam, California at a depth of about 10 km. The shallow quake was centered at 40.190°N, 121.061°W, USGS/EHP reported. The quake was followed by at least two dozen aftershocks measuring 2.5 – 3.6 magnitude, as of posting. The event was felt in downtown Sacramento, some 145 miles south of the epicenter, according to locals. The quake was preceded by a foreshock and followed by about a dozen aftershocks. One of the aftershocks struck the LA area, but the details were later removed from the USGS/EHP website. The quake and its aftershocks may have caused some structural damage near the epicenter of the mainshock. As an expression of protest against Google for censoring with impunity information posted on this Blog, Fire Earth has abandoned its research into California earthquakes. The following details were released by USGS/EHP. The quake and its aftershocks may have caused some structural damage near the epicenter. Fire Earth has abandoned its research into California earthquakes. The following details were released by USGS/EHP. Serial No 1,535. If any posts are blocked in your country, please drop us a line. The San Andreas Fault Zone [and extensions] has never before come so close to a violent major fragmentation. The quake located at 32.128°N, 115.303°W, about 60 km (38 miles) SSE (165°) from Mexicali, Baja California, Mexico, occurred on Sunday, April 04, 2010 at 03:40:40 PM (time at epicenter), and at a depth of about 10km. As of 00:26UTC at least a dozen aftershocks have struck the area, the largest of which measured 5.8 and 5.7Mw respectively. Additional shocks will follow. Large swarms of minor shocks have been occurring in Guadalupe Victoria over the last month or so. The earthquake shook building in San Diego, Phoenix, AZ, and Downtown Los Angeles, some 320km (~ 200 miles) northwest of the epicenter. Eye-witnesses described the shaking as “unbelievable” and “surreal” noting that some building towers were swaying for over a minute after the shock spread. The effect may have been due to the shallow depth of the shock, which occurred at an estimated depth of about 10km (+/- 2.5km). “One person died when a house in Mexicali collapsed, Alfredo Escobedo, director of emergency services in Baja California state, Mexico, told Reuters. He said others were reported trapped in elevators, retaining walls had collapsed in some places and electricity was out in several parts of the state.” Reuters reported. The quake also caused a two-story parking garage next to the Mexicali government headquarters to collapse, injuring several others, according to another report. Local media in Mexicali report that about a dozen people are still trapped in their homes. According to various tsunami centers, NO destructive tsunami was generated as a result of the quake. 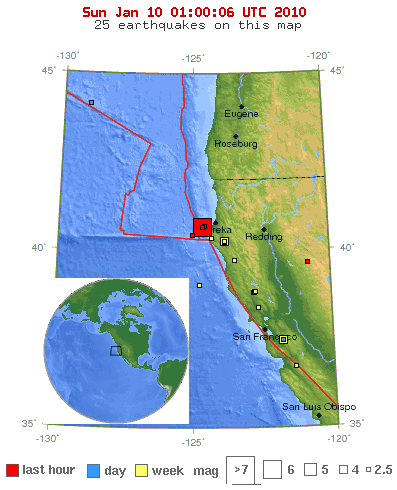 An earthquake measuring 4.0Mw Northern California at 3:49 pm Sunday (local time). The epicenter was located about 25 miles north of Santa Rosa, a report said. In response to a reader’s comment, a Fire-Earth Moderator likened California region to a lake covered with a thin layer of ice, which was frequented by too many full-time ice skaters. Location Map. Source: EMS. Click image to enlarge. Earthquake Location Map. 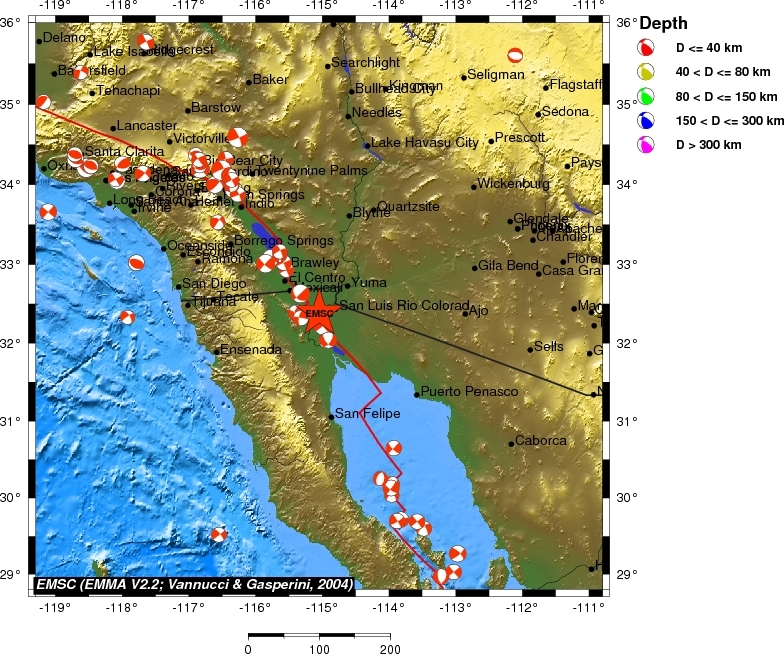 Source: USGS/EHP (Later map with correction made). Color code changed by Fire-Earth Moderators from navy to fluorescent blue for improved visibility. Click image to enlarge. Source: USGS/EHP. Click image to enlarge. In the same way “BERT DUCKS and Covers” helped to fan the flames of Cold War, the “Great Southern California Shakeout” and its “drop, cover and hold on” one-liner are engineering public alienation from nature on behalf of the Corporment. The Corporment can’t afford having large numbers of people going around worrying about how to protect nature against their usual business. Ever Heard of ‘Duck and Cover’? 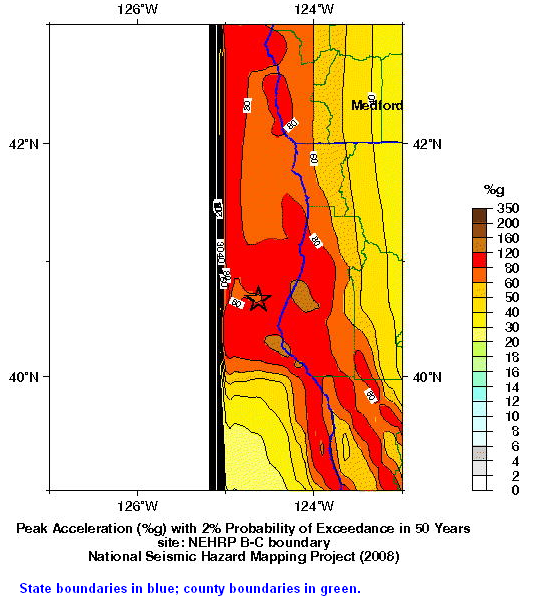 Researchers who devised the largest earthquake preparedness event ever undertaken in the United States say one of the biggest challenges was translating devastation projections from a hypothetical magnitude 7.8 San Andreas Fault temblor into timely, usable information to the more than 5 million California participants in 2008. 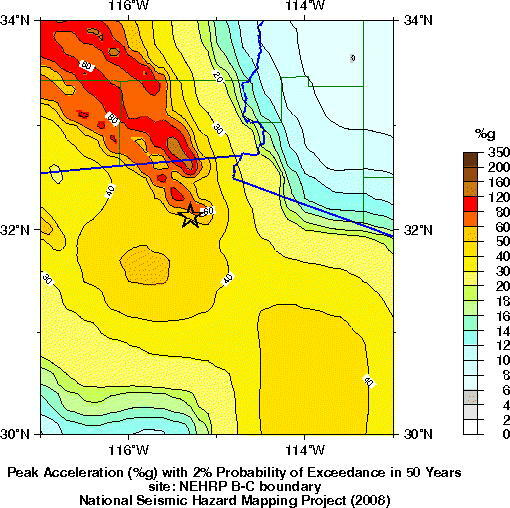 Known as the Great Southern California Shakeout, the event was designed by more than 300 experts in fields including earth sciences, engineering, policy, economics and public health, said University of Colorado at Boulder Research Professor Keith Porter, who coordinated estimates of physical damages in the scenario. He said the interests of the scientists — including high-tech research and state-of-the-art projections — did not always coincide with concerns of the general public and emergency preparedness planners looking for timely, simple information on issues. Such storms draw heat and moisture from the tropical Pacific Ocean, forming “atmospheric rivers” that cause damage on the same scale of earthquakes and are projected to become more intense as a result of climate change, said Porter. Porter is leading the ARkStorm team that is assessing the potential outcome from such a storm in terms of physical damages, repair costs and the restoration time for buildings, dams, levees, harbors, bridges, roads, water supply systems and electric power. YOU can be smart like Bert, but you need a shelter on your back, too! 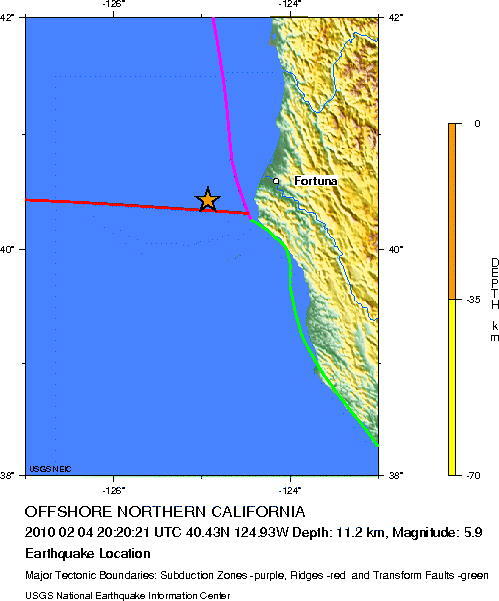 Strong earthquake measuring up to 6.1Mw struck offshore northern California about 56 km (35 miles) WNW (282°) of Petrolia, CA, Thursday, February 4, 2010 at 20:20 UTC. The earthquake was felt as far north as Oregon’s Grant Passs, south to San Francisco and east to Redding, reports said. The quake occurred about 27km (17 miles) southwest of the M6.7 January 10 (UTC) quake that shook Ferndale and Humboldt Hill, CA. Although the quake struck at a depth of about 11 km, it wasn’t strong enough to create a significant tsunami. Items reportedly fell from walls and shelves but there was no reports of serious damage, or any injuries as of posting. The January 10 quake (UTC) caused at least $40 million in damage and a serious injury when an elderly woman broke her hip in a fall, Mercury News reported. 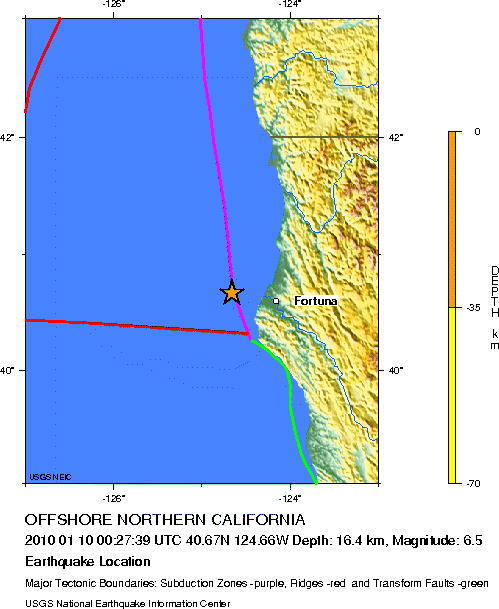 Strong earthquake measuring up to 6.7Mw struck offshore northern California Sunday, January 10, 2010 at 00:27:39 UTC. 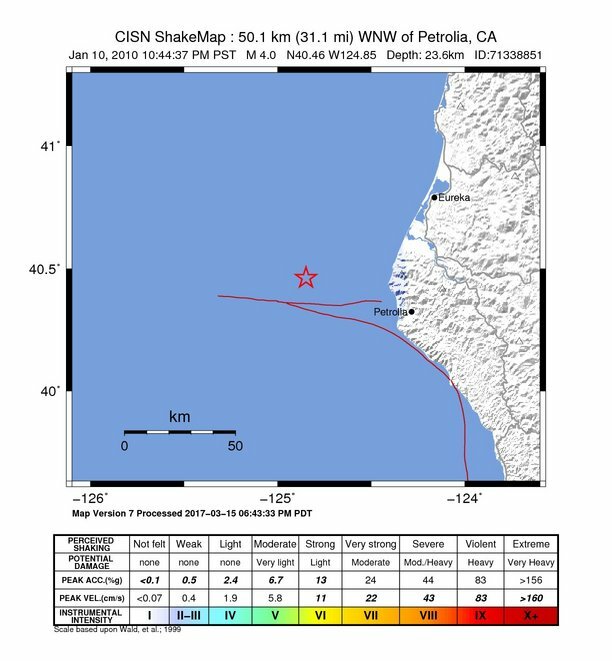 The quake was located at 40.674°N, 124.655°W about 35 km (22 miles) WNW (288°) from Ferndale, and 39 km (24 miles) W (261°) from Humboldt Hill, CA, and occurred at a depth of 16.4 km (10.2 miles), USGS reported. 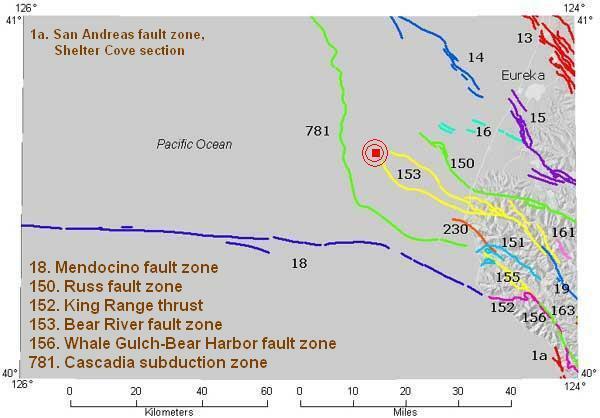 The Mainshock which occurred to the east of Cascadia Subduction Zone, was followed by at least 4 aftershocks, as of posting, the largest of which measured 3.8 to 4.1Mw. According to NOAA’s West Coast and Alaska Tsunami Center website there was no Tsunami Watch, Warning, or advisory in effect. Click image to enlarge. 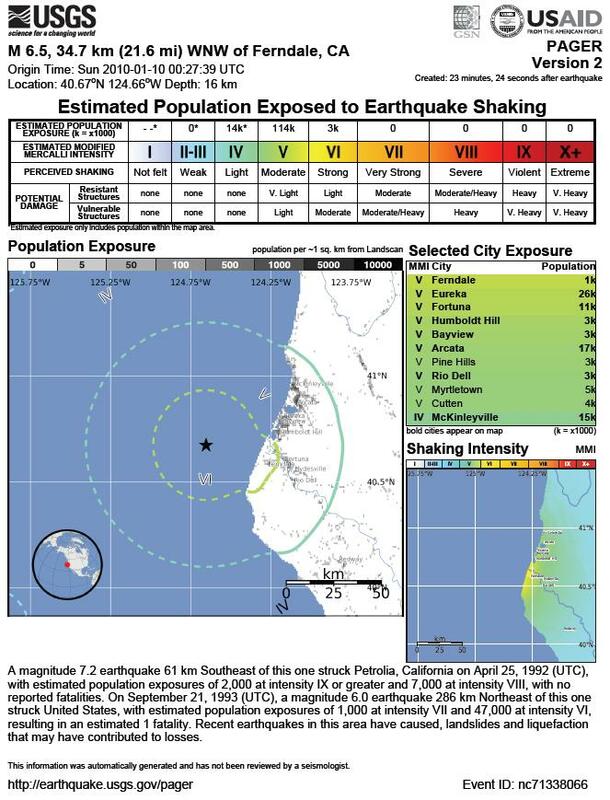 Estimated Population Exposed to Earthquake Shaking. Click images to enlarge. A strong aftershock measuring 5.5Mw struck the Gulf of California on Wednesday, August 5, at 09:13:13 UTC, USGS reported. 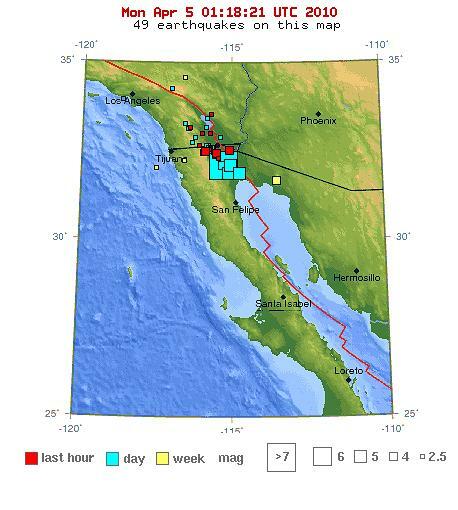 A powerful mainshock measuring 6.9 shook the Gulf of California on Monday. Meanwhile, a much stronger aftershock measuring 6.1Mw struck off west coast of the South Island, New Zealand. 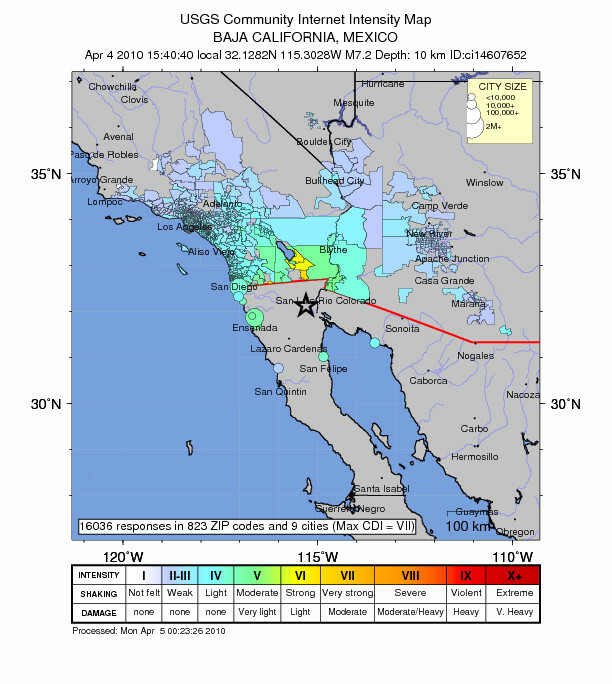 FEWW Forecasts a magnitude 7.4 earthquake and two strong aftershocks (5.5+ Mw) striking California in 2009 with a probability of 0.8. The occurrence uncertainty is about 90 days from the estimated time. 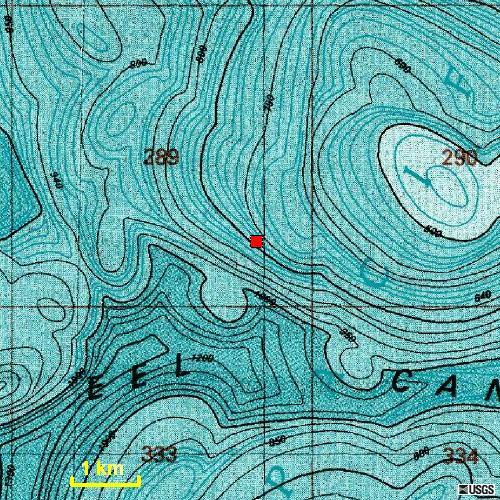 The epicenter is located in a built-up area. Moderators are currently discussing the merits of disclosing further details of the event too early ahead of the forecast seismicity.